For space heating and ventilation. Sustainable, cosy and healthy living indoors. Distributors and pilot customers welcome. Use sun on walls to heat air. See how AirSolaris collectors work. Exciting product pipeline and opportunity. What if there was a way to make new and existing buildings healthier for people and for the planet? Both more energy-efficient and with better indoor air quality. At the same time. 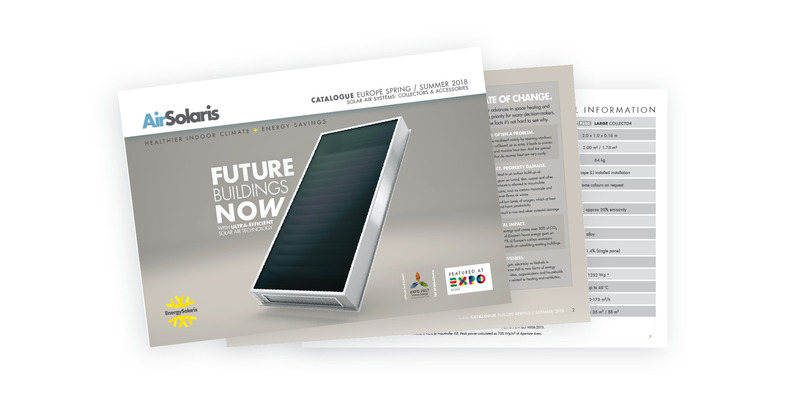 Introducing AirSolaris collectors — the future of space heating and ventilation. AirSolaris delivers the cosy, healthy living of tomorrow, today. Warm fresh air reduces build-up of airborne contaminants, such as carbon monoxide and germs, that can cause illness or worse. It also prevents high concentrations of carbon dioxide, and low levels of oxygen, which reduce alertness and harm productivity. Warm dry air absorbs humidity that can result in: toxic moulds that grow on wood, tiles, carpet and other materials when moisture is allowed to accumulate; rust and other material damage. And protecting your property is another way an investment in AirSolaris adds to the value of your building. Heating buildings with gas, electricity or biofuels is expensive. Ventilate without wasting energy opening windows. Save 15-35% off your heating bills, year after year, with 1 m2 of AirSolaris for each 20 m2 of insulated building. On top of this you will reduce health expenses (and lost income) due to sick days off work. You can breathe easy. AirSolaris collectors are made using Europe’s finest materials tested to exacting health and performance standards. German solar absorbers, air filters and insulation. Austrian solar safety glass. Eco-friendly Swiss silicone. Glue-free 100% Italian cork. Heating with 100% renewable energy: one of the key steps to a smaller carbon footprint. Buildings use 40% of all energy and create over 30% of CO2 emissions. And 17% of Europe’s carbon emissions reduction potential depends on retrofitting existing buildings with clean technologies like AirSolaris. Air quality is key to our health. …goes on space heating (in Europe). Don’t waste your solar potential. Warm fresh air. Even in winter. Hope we tick your boxes. Drop us a line below if you see any synergies. Check our blog. Follow us on social. And write us below to receive updates.